In Greek mythology, Antigone is regarded as a very strong and powerful woman, one who speaks her mind and also follows her heart. 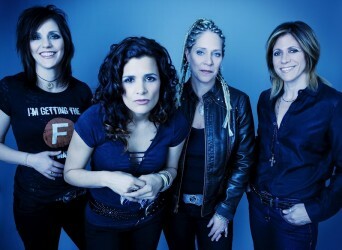 The band Antigone Rising has been following their heart for the last 20 years and rockin’ all along the way despite line-up changes and label shake ups. Founding sisters Kristen and Cathy Henderson have provided a solid foundation for the band and a philosophy of working harder than the boys and making fans feel like family. Early 2014 saw the release of their EP “Whiskey & Wine – Vol. 1” which featured “That Was the Whiskey”, an alt-country song born from life on the road. The single reached #7 on CMT charts and has brought an entire new fanbase into the fold for the band. On October 28, 2014, Antigone Rising will be releasing “Whiskey & Wine – Vol. 2” which is sure to be a rocking good time, full of more toe tapping tunes from a band that has not stopped putting out great music for 20 years. Antigone is a Greek Legend, not a myth, so that means she really lived. She’s considered to be the first feminist in history  she defied the King to stand up for what she believed in. The band studied Greek Tragedy while we were in college at Bucknell University and the name just made sense to us at the time! How would you describe Antigone Rising and your music? We’re a band who believes in the grassroots nature of the music business. We love our fans and the interaction we’ve been able to have with them from the beginning of our career – even before social media became the norm. And we hope to write great songs that people like to listen to. For us, it’s very much about the live interaction and getting to meet and play for the fans. Between the four of us, I’d say we have several. The Beatles, Jimi Hendrix, Shawn Colvin, Patty Griffin, Cat Stevens, The Allman Brothers Band – I could go on for days. Where do the inspirations for your songs come from, and what is the creative process for writing them? Life events in general are the inspiration for many of our songs. Our kids have crept their way into our writing lately. But so have roadhouse birthday party gigs (our song”’That Was The Whiskey” is based on Nini’s birthday celebration while we performed at the 30A Songwriters Festival). What is one of your songs that has a very personal meaning? On our upcoming EP – “Whiskey & Wine Volume 2” – we have a song called “My Town” that was inspired by the loss of a few people who live in the town we live in. It’s a tough one to perform live without getting emotional. Which one of your songs have you found most connects with your fans, and why do you think it does? People really love “That Was The Whiskey”. I think people like songs you can stomp your feet and dance to. Plus most people know what it feels like to regret some of things they’ve done the night before. In March of 2013, Kristen was on the cover of Time magazine kissing her wife. The story was entitled, “Gay Marriage Already Won”. Has there been any negativity towards the band because of the article? Anything positive? My wife and I were pleasantly surprised at how positive the reaction was to our Time Magazine Kissing cover. Time Magazine prepped us for a media backlash along the lines of the Breastfeeding cover they had done a year earlier, and it turned out it was much ado about nothing. Geraldo Rivera and Bill O’Reilly were both extremely complimentary over it. So you know the tides are shifting. How do you juggle being part of a rock band with being a mom? Juggle is a good word to describe it. I think it’s very similar to what any working mom goes through except we travel a lot. When I’m home, I’m here for the daily schedule. The funny thing is, my kids don’t like when I get my hair cut or when they see guitars coming out of the closet because they know it means I’m leaving to go on tour! The other day I picked my daughter up from school after getting my hair chopped off for our upcoming dates and she started crying at pick up because she knew it meant I must be leaving. At the end of last year, at your show at Rockwood Music Hall in NYC, you let fans crowd shoot your video for “Everything Changes”, what was this experience like? Will you ever do another crowd shoot video? We will definitely do another crowd shot video at some point. That was a really fun video to shoot, but I think there are things we learned during the first shoot that we will improve up in the second one! For example, we didn’t get enough crowd shots of everyone pointing their smart phones at us. That’s a regret and for the next fan shot video there will be a lot more actual fan footage in the final edit! What was the reason for releasing 2 EPs rather than one full album. The music industry and social media are forcing artists to rethink how we release music. It’s not enough to write great songs or be a great band, You have to know how to stay on top of people’s minds. So our mantra is to never disappear from our fans newsfeeds. And the way to do that is to release a constant stream of new music. Every few months we put out a new song and twice a year we release a 5 song compilation of the songs we’ve released. That’s our new philosophy and it’s working. “That Was the Whiskey” was born from life on the road. What was the writing process like for that song? I think I mentioned earlier that “That Was The Whiskey” was inspired by a night we played at a roadhouse bar at the 30A Songwriters Festival. It happened to be Nini’s birthday. Our friend, singer/songwriter Lori McKenna was at the show and as soon as we came off stage she said we needed to write a song about what she’d just seen. So a few weeks later we drove up to Lori’s place and as long as the song is, is about how long it took us to write it. Sometimes it can be really easy…..rarely. But sometimes! What’s your favorite song from the EPs? My favorite song from W&W Volume 1 is “That Was the Whiskey” and favorite from Volume 2 is “My Town”. Both songs are honest – one is from the heart and one is just a lot of fun. Touring and finishing up Whiskey & Wine Volume 2! Looking forward to 2015 and seeing everyone out on the road. For more information about the band, visit antigonerising.com. Posted November 4th, 2014 & filed under Entertainment.